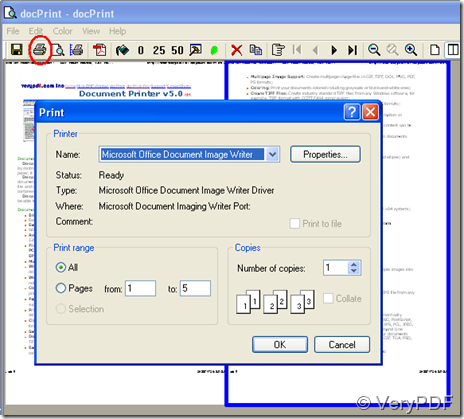 How to use the docPrint printer? 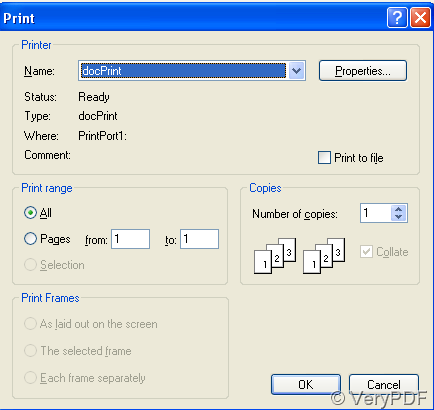 Actually, docPrint is not only a printer. It can also act as a converter which supports various formats. But this article will mainly show you how to use it as a printer. If you don’t have this software, please go to download it at http://www.verypdf.com. After you install this software in your computer, let’s go to see how easily you can use it. Open the file or the web page you want to print, here I would like to take THE web page http://www.verypdf.com/artprint/index.html as an example. 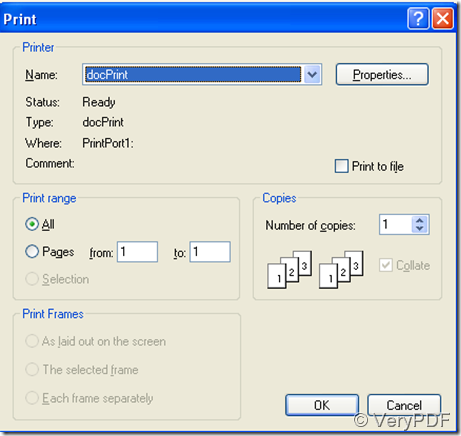 Step 3: Select “docPrint” on the drop-down menu of “name”. Step 4: Select more advanced options. You can select various layout options by clicking on “Advanced” button. 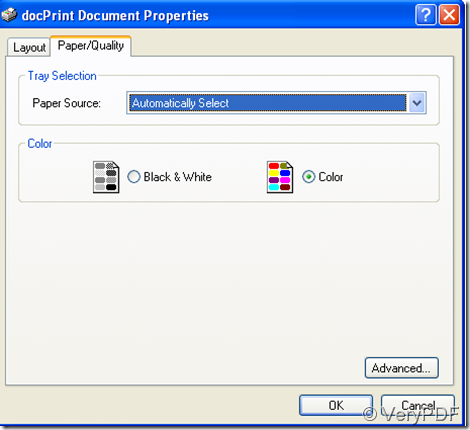 For example, if you want to print two pages, or six pages on one piece of page, then you can select the number on the “Page Per Sheet” drop-down menu; or if you hate to waste ink, you can click on the “Paper/Quality” button, and select the “Black &White” option under “Color”. For the sake of concise, I will not introduce all the advanced choices in detail here, but I will write another article to introduce them in another article. After setting page size, color, etc., click on the “OK” button. A few seconds later, the icon of the printer on the taskbar as below will disappear, which means the printer is ready for printing. You can preview the pages, and set some options before you really print your file. For example you can choose to print a watermark on paper, and select the page margins like small, medium or none. 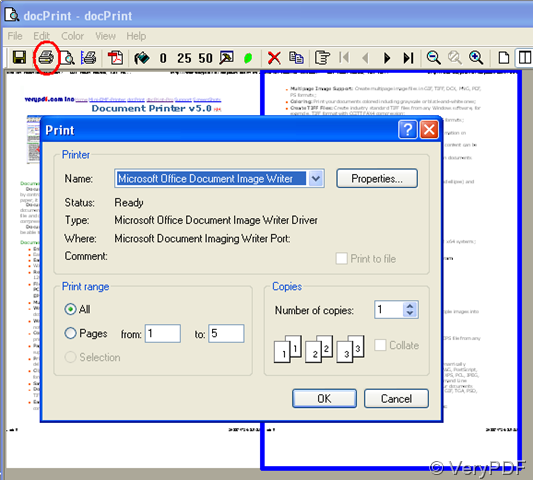 Click on the icon marked by red circle, then, select the name of the real printer driver on the drop-down menu of the new prompt as below, then you can print you file. PDF Batch Print Scaling Issue. 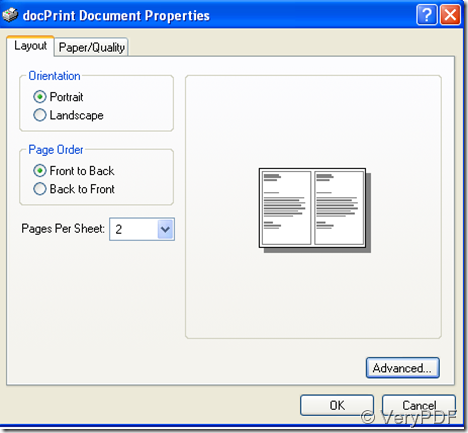 How to print PDF file to 24"x36" paper size? Printing PDF files with scaling. 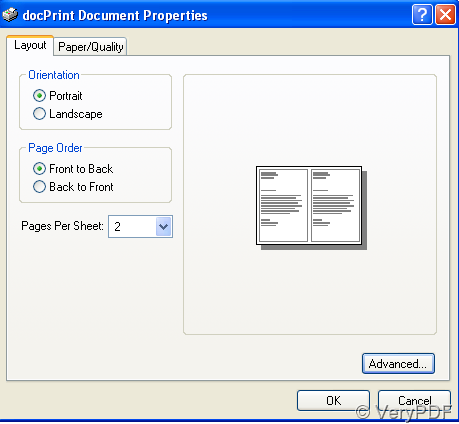 Scale or resize printed pages. Page scaling lets you shrink or enlarge pages when you print.